also If Wet which will be brought along to Supersonic Festival this May. We caught up with Sam to talk about his upcoming performance with Glatze. See our mini Q & A below. Tickets for this event can be purchased here. 5 years on, what’s it like knowing you’ll be back sharing the stage at a Capsule gig with Melt Banana all over again? It means a lot to me. I have warm memories of my first encounter as an artist with Capsule and I have been a Melt Banana fan for many moons. Capsule have continued to support me since that day and I can’t wait to dust Glatze off for another outing alongside Melt Banana; for old times’ sake. Sam, you’re a busy man…you build instruments (MortonUnderwood), play in Ore and also run your own monthly event, If Wet, which will be transported to Supersonic Festival later this May. How do you balance all of these different projects and where does Glatze fit in? play. He’s my light relief. 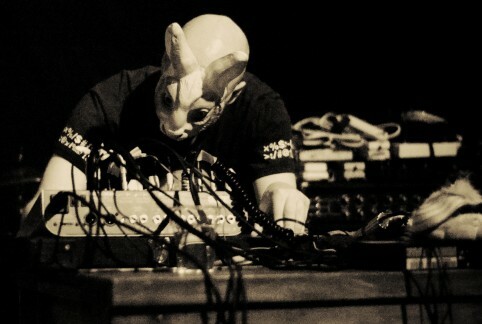 Image courtesy of Pete Ashton: Taken in 2009 during Glatze’s last performance alongside Melt Banana. Who are some of your musical (or otherwise) influences? 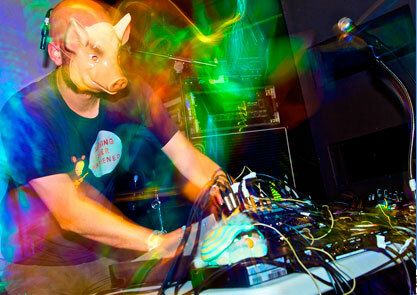 Glatze is all about attention grabbing, energetic live performances so draws influences from the likes of Henry Rollins, Afrirampo, rave DJs such as Sy and Slipmatt, and of course Melt Banana! How do you go about writing a song? Do you jam and figure stuff out that way or is the writing process much more structured? As Glatze, my music always has half an eye on what the live aspects of it will be. It mainly starts with studio production, although tunes range from fully improvised pieces that are constructed entirely live to heavily produced dancefloor vibes with me just twatting about over the top! What can people expect from Glatze live? Glatze is older and wiser now so expect more madcap inventions and theatricalities than ever before, and the usual fun-at-all-costs mentality! For tickets to see MELT BANANA plus GLATZE and THRILLING HEADGEAR go here.